High-Rise, directed by Ben Wheatley, is a 2015 British film based on J.G.Ballard’s 1975 dystopian science fiction novel. Starring Tom Hiddlestone and Jeremy Irons, it tells the story of doctor and medical school lecturer Robert Laing who moves into a new apartment on the 25th floor of a state-of-the-art high-rise building on the outskirts of London. The tower provides its well-established tenants with all the conveniences of modern life: a supermarket, a swimming pool, a school, a restaurant, high-speed lifts and, naturally, a squash court. Thankfully, in the squash scenes, both Hiddlestone and Irons do seem to have played the game before. Although not necessarily on blue squash courts. Trade cards first became popular at the beginning of the 17th century in London where they were typically distributed by businessmen to clients and potential customers. Unlike visiting cards, which were exchanged in social circles, they functioned as advertising and also as maps, directing the public to merchants’ stores, as no formal street address numbering system existed at the time. 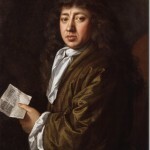 The famous diarist Samuel Pepys (1633-1708) is known to have been an early user of trade cards in his professional capacity as a naval administrator, and left a collection of them which is now preserved at Magdalene College, Cambridge. Until the development of colour printing in the 1870s, few companies specialised in the bulk production of ‘stock’ trade cards, usually having an image on one side and space on the other for businesses to add their own information. Then, as production became more widespread and designs became more attractive and colourful, collecting and exchanging cards became a popular hobby. Some cards, particularly those produced by tobacco companies featuring baseball players, later developed into collectibles and gradually lost their function as business advertisements. In the 1880s, squash was beginning to gain in popularity in England and elsewhere. 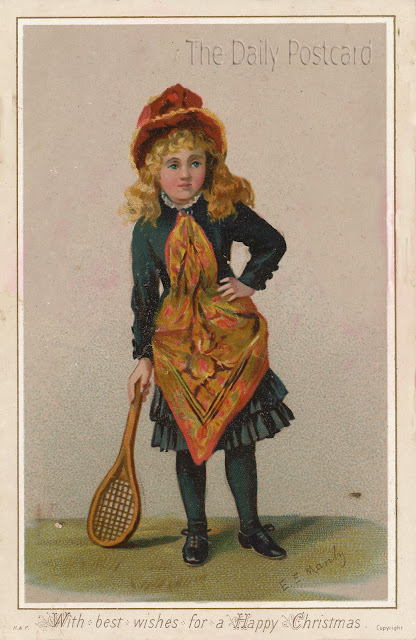 So perhaps the existence of a trade card from that period featuring young lady holding a squash racquet shouldn’t come as a great surprise. It’s possible that the card was advertising the services of the artist, Eleanor.E.Manly, an English Victorian artist specialising in children’s portraits whose most productive period was from the mid-1870s until her death in 1898. It also bears the greeting ‘With best wishes for a Happy Christmas’ which suggests that it was produced for distribution during the festive period. The earliest squash Christmas card? We’ll probably never know. But with Manly’s work still being bought and sold after in the top art auction rooms of the world, it’s nice to think that someone, somewhere may still have something valuable locked away in the attic. And it’s got a squash racquet on it. Thanks to Christine H of Portland, Oregon whose love of antique postcards shines through on her blog The Daily Postcard. Well, I’m just about old enough (really!) to remember playing with a wooden squash racket – or at least a squash racket with a laminated wood frame. Not only did it have a frame made from ash but, in common with the guitar I was learning to play at the time, it also had natural gut strings made from animal intestines. The approach to repairing squash rackets in those days seemed to vary from the professional (re-stringing and frame repair by a specialist) to the amateur (involving the use of a mind-boggling variety of adhesives and other materials then in domestic use. I personally remember using Araldite, Evo-stik, paper clips (straightened of course), fuse wire and electrical insulation tape to repair my squash rackets, some of which were contributed by my fellow squash players along with bold claims as to their effectiveness. So, when I recently came across some footage from 1976 of a squash match involving eight times British Open Squash Champion, Geoff Hunt, using a wooden racket – the memories came flooding back. Here it is, posted on the internet by Hernan Dubourg, himself a nine times Argentina National Squash Champion. One feature of the match – between Hunt and Pakistan’s Mohibullah Khan – is the length of the rallies. I’ve seen a longer recording from the match which shows many of these lasting for 50 shots or more. Perhaps the footage shows that the rackets of the time were just as good as those of the modern era (in terms of the power of shot they could be used to generate) but were not as suited to touch play at the front of the court. Who knows? But let me invite you to just listen to the sound when the squash ball is being hit. I don’t know about you but, as a former wooden squash racket user, it certainly does sound like music to my ears.